Click on the buttons below to view all the tour dates and locations for our Explore exhibitions. The STAR_Net team selected 42 public library sites to host national tours of three panel exhibits: 1) Explore Earth: Our Changing Planet; 2) Explore Space: A Cosmic Journey; and 3) Explore Tech: Engineers Make a World of Difference. Each exhibition will travel to 14 sites. Public libraries in rural areas and those serving rural populations and groups underrepresented in STEM fields were especially invited to apply. 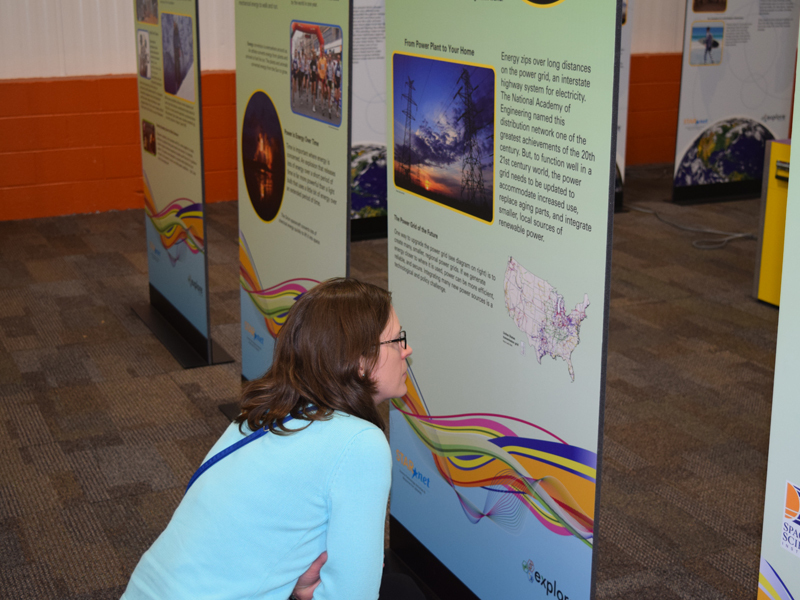 The three Explore exhibits include a research study and evaluation of informal science education in a library setting. The knowledge gained about the nature of informal STEM learning in libraries through the evaluation of these exhibits will benefit both libraries and the informal STEM education (ISE) community. All three Explore exhibits will tour from February 2016 through July 2018. Selected sites will host the exhibits for two months. 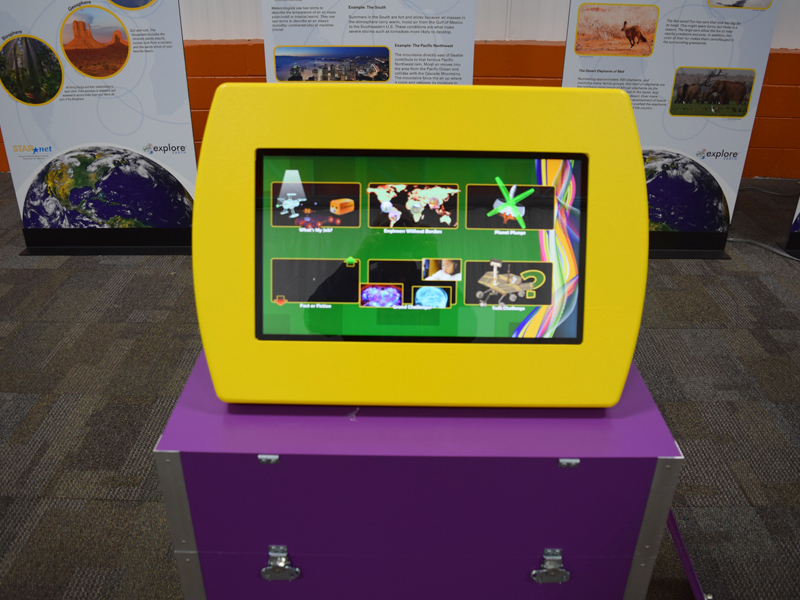 Each exhibit includes 6 double-sided panels, a computer kiosk, and hands-on materials for a Discover Station. They require 200 square feet of space for optimal display. Each site will be awarded a grant of $1,000 to support public programs related to the exhibits. Each host library will actively participate in a national professional learning community called the STAR_Net Online Community. The project included an orientation webinar for each exhibit. 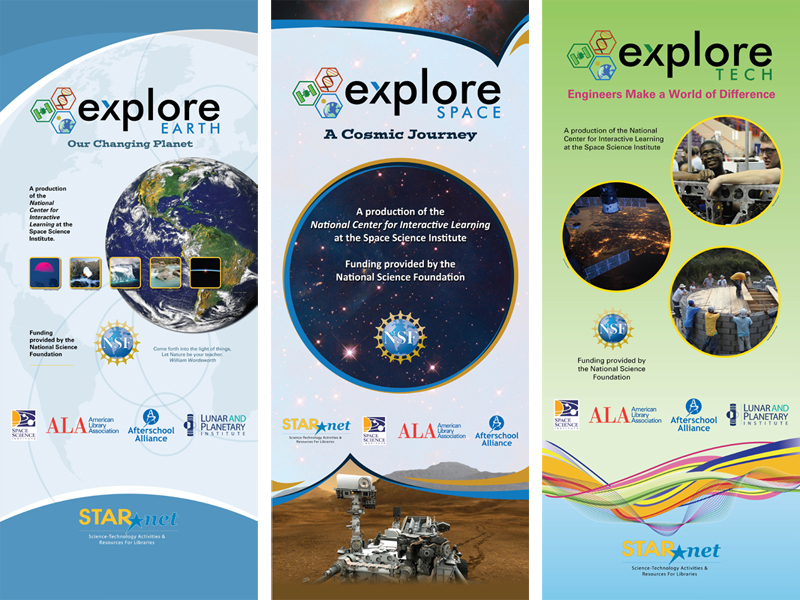 The webinars featured presentations about exhibit set up; hands-on science activities related to each exhibit created by the Lunar and Planetary Institute (these were developed as part of the STAR_Net Discover exhibits); programming and outreach consultation with the Afterschool Alliance; and a number of professional training resources, including the STAR_Net Online Community. The view from space has deepened our understanding of Earth as a global, dynamic system. Instruments on satellites and spacecraft, coupled with advances in ground-based research, have provided us with astonishing new perspectives of our planet. 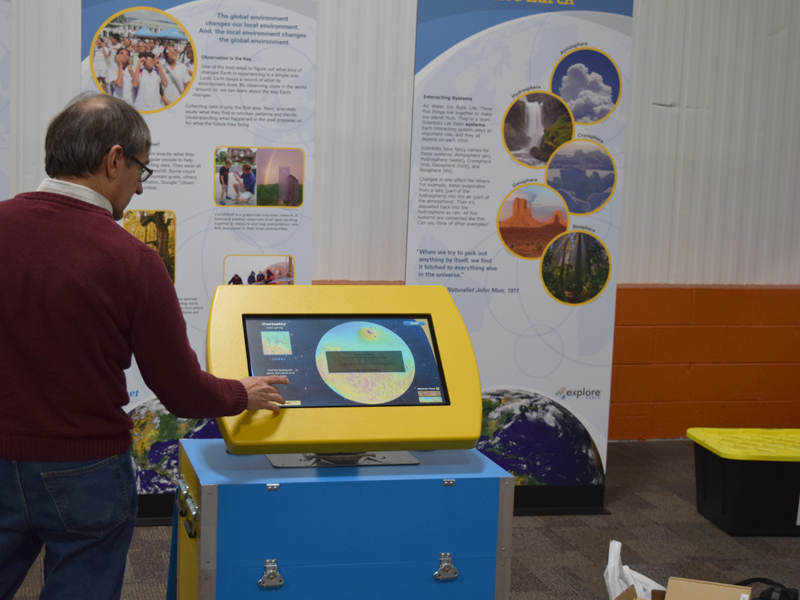 The Explore Earth exhibition will focus on local earth science topics—such as weather, climate, and ecosystem changes—as well as a global view of our changing planet. The primary message of the exhibition is that the global environment changes – and is changed by – the local environment of all host communities. The exhibit is divided into three areas: A. Our Changing Planet, B. Ecosystems: The Web of life, and C. Environmental Change at Home. Library patrons will learn that Earth is a complex, global system of interacting subsystems—rock, water, air, and life; understand that Earth’s global system changes on short and long-term time scales; understand the water cycle and the important role that water plays in the earth system; learn about the basics of weather and how meteorologists predict it locally; understand the difference between weather and climate; and learn how to become a thoughtful steward of Planet Earth. 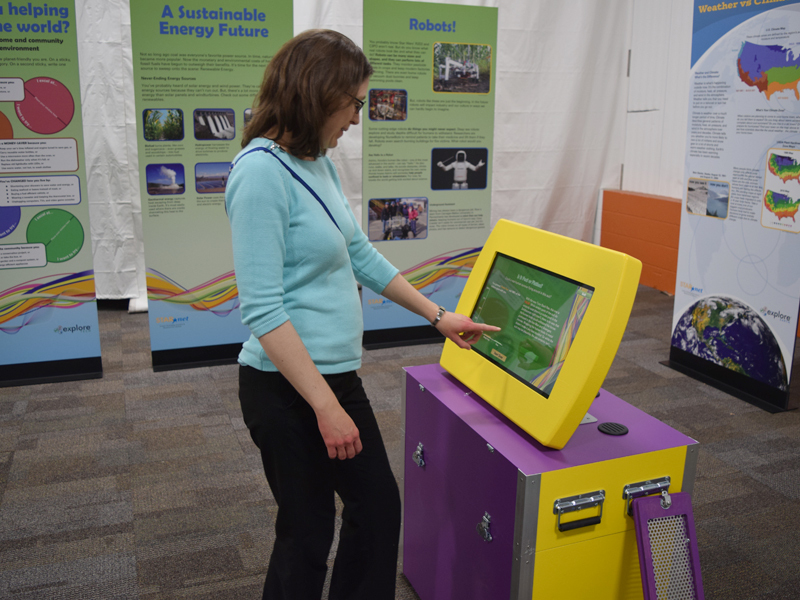 The exhibit includes a touchscreen computer kiosk that contains several interactive experiences that engage children and adults. These include Wild Weather, Earth Stories, along with a Quiz game. Space exploration and research will help us answer the age-old questions: Where did we come from and are we alone? NSF and NASA research programs are helping humanity understand the origin and evolution of galaxies, stars, and planets, and defining the conditions necessary to support life beyond Earth. The four exhibit areas are: A. Space: The Final Frontier, B. Electric Space, C. Exploring Our Solar System, and D. Cosmic Journey. Exhibit goals for visitors are: 1) Learn how stars and planetary systems form and the role that gravity plays, 2) Understand the similarities and differences between Earth and Mars and the tools we use to explore planets, 3) Explore the role that asteroids and comets play in our Solar System, 4) Learn that the Sun is a dynamic star and how it varies, and 5) Explore electric and magnetic changes that take place in space (e.g., the aurora). The exhibit will include a touchscreen computer kiosk that contains several games that will engage children and adults. Some of the interactive experiences include Mission to Mars, Magneto Golf along with a Quiz game. This exhibit shows how engineering provides solutions to better meet human needs and develops sustainable innovations for the future, and how engineers create new technologies to solve problems. It features hands-on and multimedia components that allow exhibit visitors to interact with exhibit content in a dynamic way, encouraging new perspectives about engineers and their vital work. Visitors will become familiar with the National Academy of Engineering’s 14 Grand Challenges for Engineering, critical issues that must be addressed in the 21st century. They will also learn about the fundamental principles of energy, become aware of their own energy use, and understand the impact of engineering on societies over time and place. The exhibit includes three areas: A. Engineering: Past, Present, and Future, B. High Tech/Low tech, and C. Power Up! Creating a Sustainable Energy Future. The exhibit will include a touchscreen computer kiosk that contains a several games that will engage children and adults. Some of the interactive experiences include Game Changers, which is about the Grand Challenges, along with a Quiz game.